This pie project can take unexpected turns. Today I thought I would make a quiche for new grandparents but because I could not contact them, I chose instead to make a pie for a couple that had recently moved to Ashland. My friend had told me about them a week or so ago, and today seemed to be the day to bring a pie to them. And then, I had to decide what kind of pie to bring: sweet or savory. Since I had just purchased some organic fuji apples I thought, apple pie! Well, as sometimes happens, the apples held secrets under the skins – two of the apples were perfect and two had flaws – and by the time I was done cutting them up I realized I needed to add something to the mix to really complete this pie. 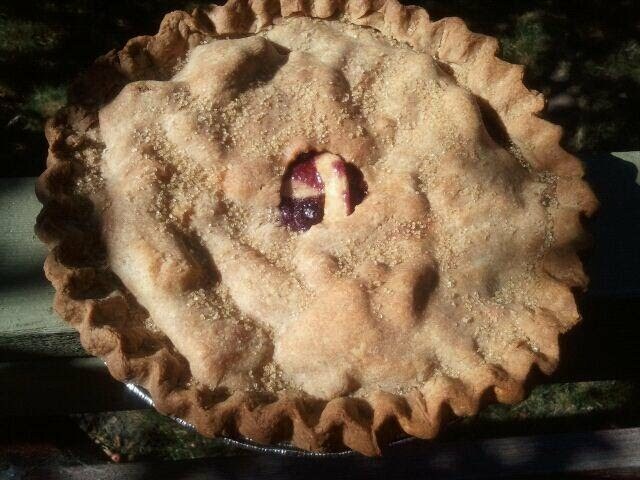 After a little bit of pondering, I decided to add about 2 cups of blueberries to the apples and then covered it with a top crust to make an Apple Blueberry Pie. At about 5:00 PM I set off to deliver this beautiful (if I do say so myself) pie. Once I found the address, I parked my car and walked up to the front door. Peter greeted me and I said (almost immediately) “Hi, I am a friend of Katrina’s….” and Peter told me that Katrina was visiting with his wife on the back porch. Later he told me that once I said I knew Katrina he knew that I was alright. Isn’t that great? It’s that kind of trust that gives us comfort – in other words, if you’re a friend of my friend, then you are my friend as well. Tonight I sat with Mari, Peter and Katrina and talked for two hours about many things. I found out that Mari has had an amazing journey these past few years. About three years ago, she drank some raw milk and became paralyzed. She has, with the help of her husband and sons, made an incredible recovery. I am in awe of her strength and determination – and also of the support of her family. They know what real love is all about. As I write this, my primary desire is to say how grateful I am to be able to spend time with so many people simply by bringing them a pie. It is really such an amazing gift. And while it is a little bit of an effort to make a pie each day, I have found that this simple act of giving has made so many people happy. And that’s when I think, isn’t that what we are here for after all? PS Mari and I had your pie for dinner! YUM! Thank you Mari! I am so glad that Katrina gave me your names! It was delightful meeting you and I hope that as soon as things calm down we can all get together again.